Studies show that up to twenty percent of Americans suffer from IBS, ten percent suffer from diverticulosis, eighty percent of Americans suffer from occasional constipation, while upwards of twenty percent suffer from chronic constipation; also, colon cancer is on the rise in young adults age twenty to forty-nine. Maintaining a healthy colon sounds pretty important, right? This is why I will be doing a multi-part series over the next few weeks outlining my favorite products from Young Living that help maintain a healthy digestive system. First we need to talk about what a healthy colon looks like. You can gauge the health of your colon with two simple questions. How many times a day do you have a bowel movement? A healthy bowel eliminates two to three times per day. Not weeks, folks. Food goes in, digested food comes out. A healthy bowel does not need laxatives or stimulants in order to empty. 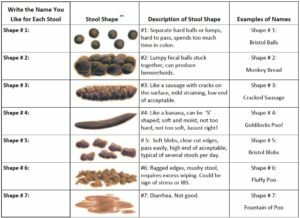 What is the shape and consistency of your bowel movements? Use the following Bristol Chart to see whether your bowel movements are healthy of not. Feel free to come up with your own names. Various issues and conditions inside your GI tract can cause the other forms of stools you see on the chart. One of the best ways to help increase your number of bowel movements and bulk up your stools for easy elimination is by adding fiber to your diet. You can do this by eating more raw vegetables, but I find I don’t have the time every day to get the fiber I need. 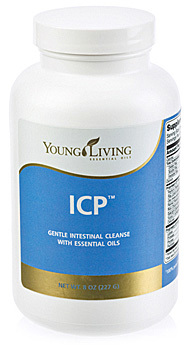 I have tried many fiber supplements over the years and I have not found a fiber I like better than Young Living’s ICP. ICP combines dietary fiber, soluble fiber, insoluble fiber, psyllium seed, flax seed, oat bran, fennel seed, enzymes, and numerous therapeutic-grade essential oils to create an advanced mix of colon-cleansing fibers that decrease the buildup of wastes, improve nutrient absorption, and help maintain a healthy digestive system. It does have a licorice flavor due to the fennel and anise essential oils, but I find that I do not mind the taste at all when I mix it in a smoothie or coconut milk. My gut thanks me multiple times a day with proper elimination when I take this daily. I recommend starting with one teaspoon, twice a day and increasing by one-half teaspoon a day until you are experiencing daily bowel movements. Should you increase too quickly or have loose stools, stop for twenty four hours and start back at one teaspoon, twice a day. Next week I will continue this multi-part series on digestive health.